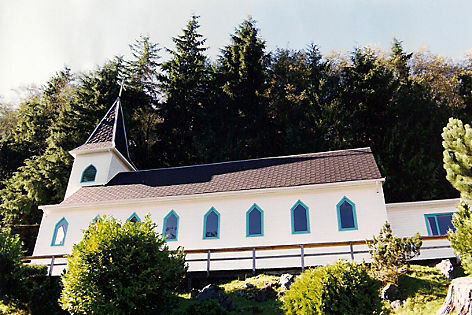 Tahsis’s Roman Catholic Church is a Heritage building built in 1948 with a breathtaking view of the Inlet. The residence was added in 1954. Initially, St. Joseph’s had a full-time Priest and Sister, but in more recent years the church has a visiting priest once a month with a full mass, and a Social following. Lay members of the congregation conduct a communion service the rest of the month. Everyone is welcome, visitor or local, to attend the services on Sunday at 11:00 a.m., and to attend the Socials following when the Priest has given the Mass. Special services are held during Christmas and Easter weeks.